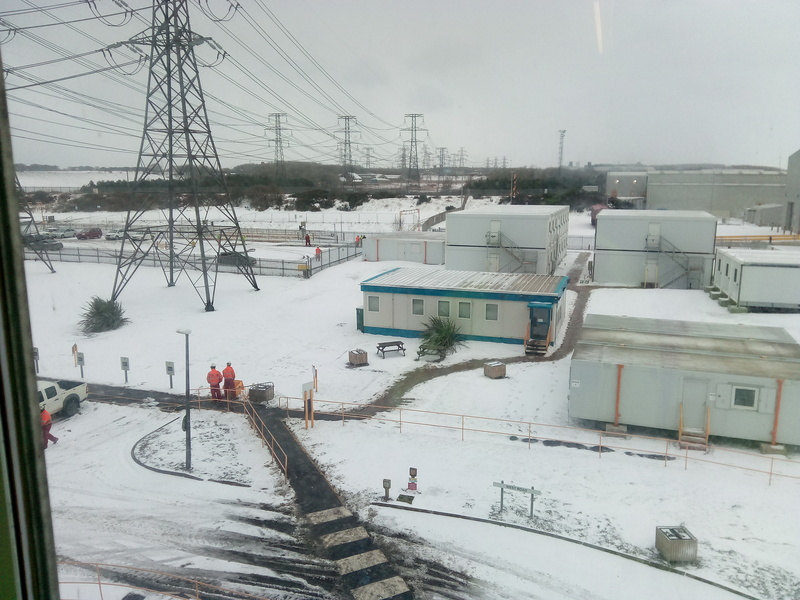 I told the guys in the countdown thread that I've been working at an old power station (electricity generation plant) in Lynemouth, Northumberland. 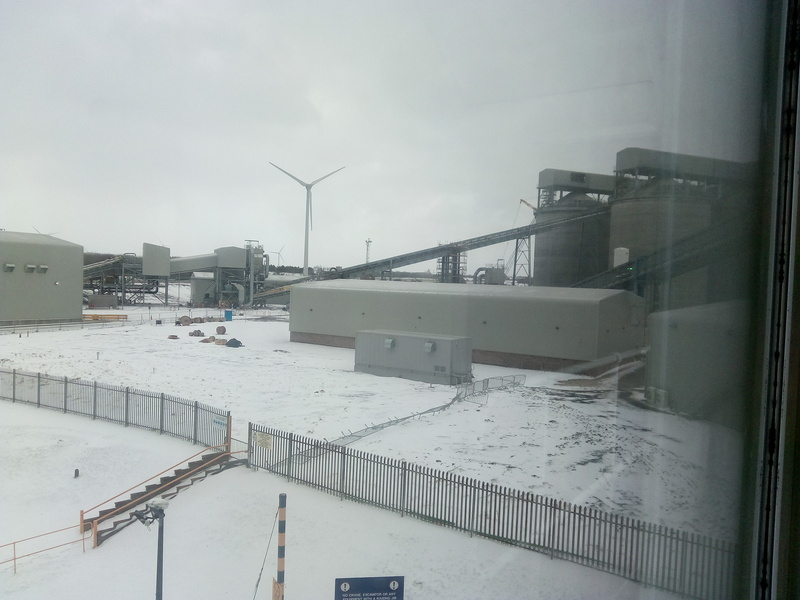 The plant is being updated to burn so-called "biomass" (wood pellets shipped in from Canada) instead of coal. I promised I'd snap a few photos on my phone and post them here. The silos where the pellets are stored. I thought the pellets arrived by ship but then someone told me there are some even larger silos "at the port" so maybe they are transferred to these silos by road or rail. The engineers working on the update are partly based in these huts. The turbine hall where the three sets of steam turbines and generators are housed. 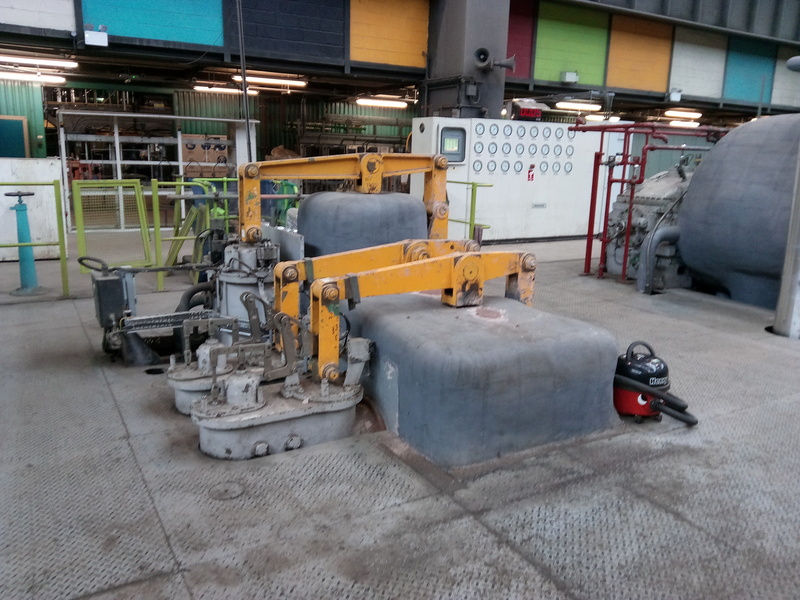 The turbine hall itself seems fairly uncluttered, but that is because a lot of the pipework and other gubbins is hidden away on the floor below. Everything is bigger than it looks in the photos. Here a group of engineers have removed the top cap of the connection between two stages of one of the turbines for inspection. 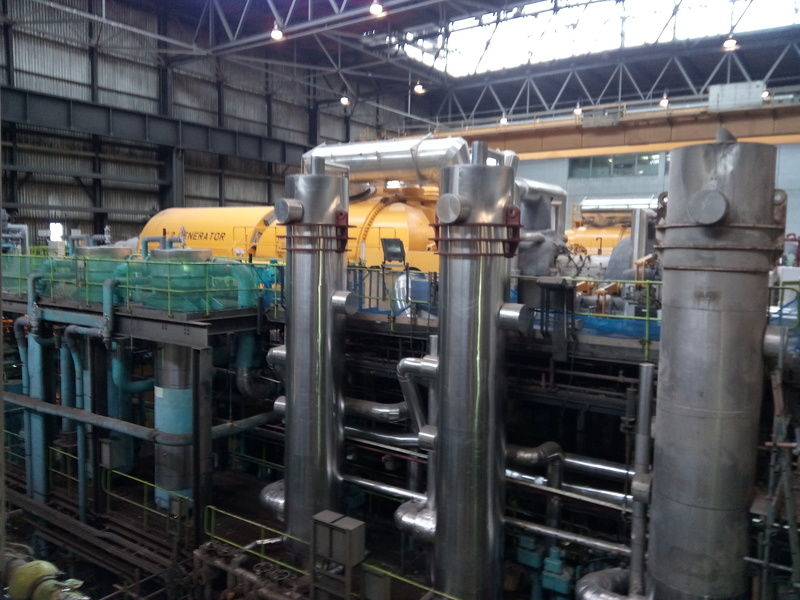 These are some of the valves that control the flow of steam through one of the turbines. 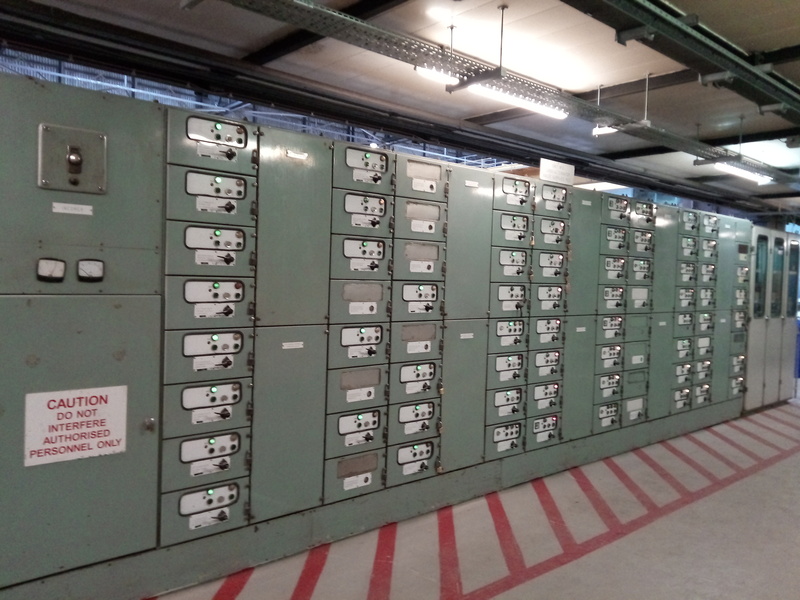 There are some nice old-fashioned indicator panels in the turbine hall that allow the performance of the turbines to be monitored. ...and some less pretty panels too. 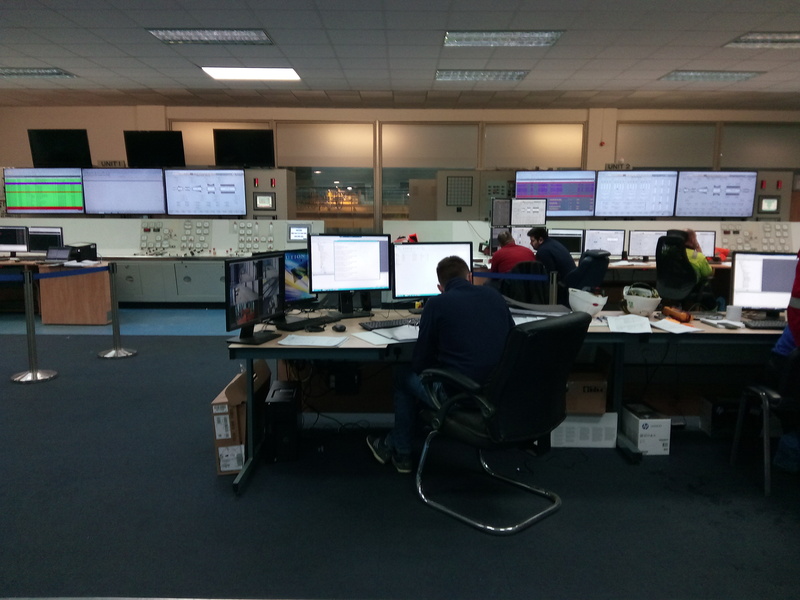 Actually, most of the monitoring is done now from the control room so there is no one anywhere near these panels during normal running. The turbine hall is actually just a small part of the plant. A much larger volume is devoted to all the pellet-grinders, blowers, feed system, furnaces, boilers, condensers and so on... This is where I was mostly working but it would take weeks to photograph everything. It's much darker and dirtier than the turbine hall but here are a few snaps to give an impression. Remember, everything is bigger than it looks. Shakespeare would no doubt have grave doubts about the correct designation of this bit of equipment. Finally, this is how the product of the plant flows away to be sold to customers. I like the way someone took the trouble to paint some of the brickwork in the turbine hall in panels of different pastel colours. At first I wondered if it was some indication to do with how much load the crane could lift when it was positioned at different points along its support girders, or maybe equipment to do with the different phases of three-phase electricity, or different temperatures and pressures of various steam pipes - but the patterns of colour don't seem to make sense for that, so until someone who knows better tells me otherwise, I shall think it was done just to make the place look prettier. All the dials I want to walk up to them and tap the glass to see if they are working. I'm more of a big GREEN button kinda girl GO, LAUNCH, RUN, START! Every. Damn. Day. that I worked in a plant like that. Every damn day, almost an irresistible urge. Almost, because doing so would have cause me 4-6 hours of hard work. Consequences. Mmmm. 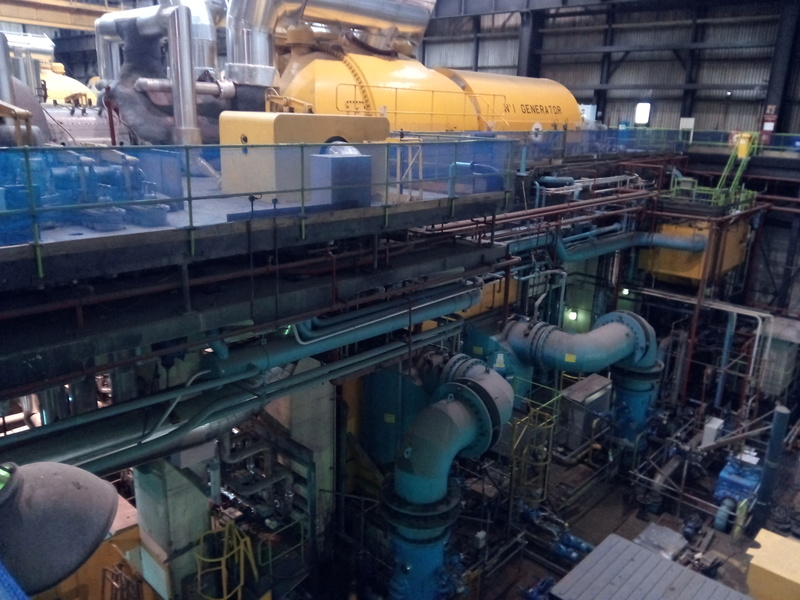 Steam turbines. In the ammonia fertilizer plant we had lots of them, running gas compressors instead of generators. 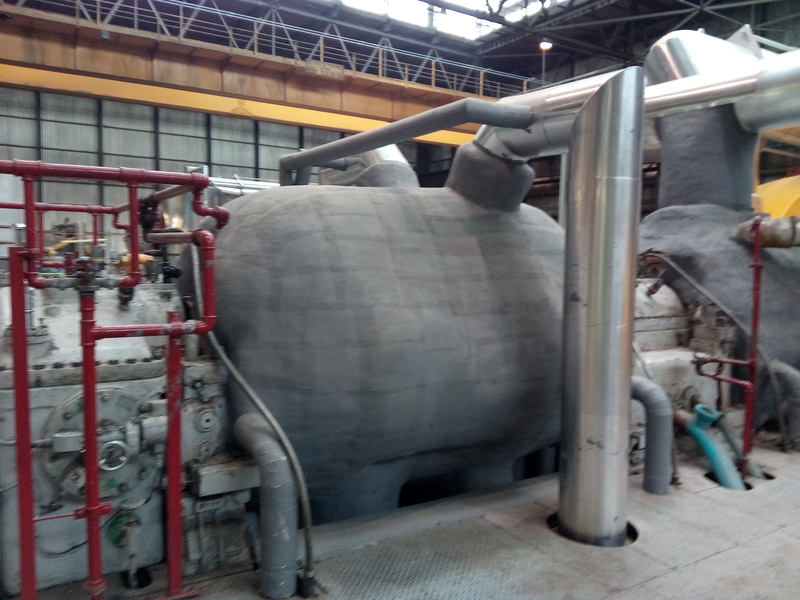 One of them was a two-stage turbine, it had 1500 psig steam on the first stage, 600 psig on the second. Fun stuff. I was up there again this week and asked one of the knowledgeable guys in the control room why they did that. He said the main reason is that it cools the generator better than mere air would - the hydrogen is circulated through the generator and a heat exchanger to cool it back down before it goes round again. The hydrogen also helps the generator windings last longer before they start to decay - I suppose pure hydrogen is less reactive to hot enameled copper wiring than air is. Apparently using pressurized hydrogen is pretty standard for this type of generator. Some hydrogen inevitably leaks out so they need a hydrogen production plant to produce fresh gas. 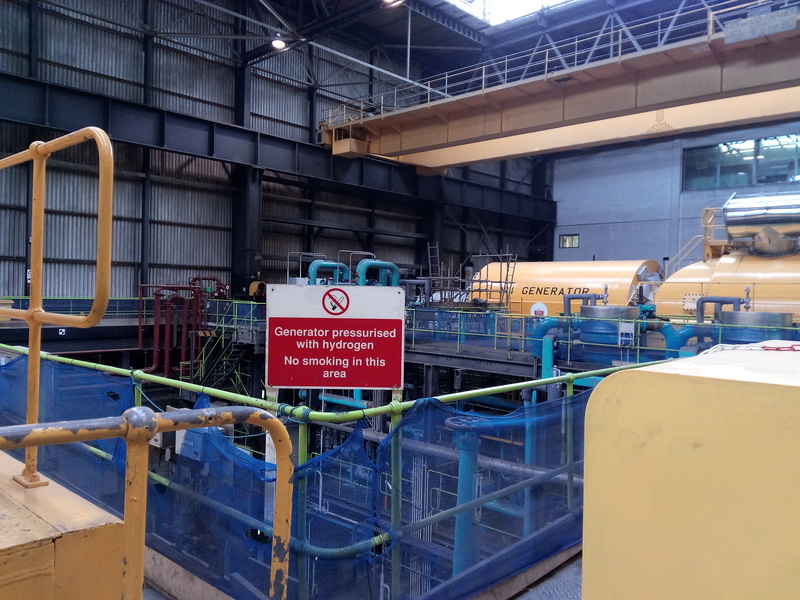 The control room guy told me that in more modern power stations the hydrogen production/storage facility tends to be located in a separate building for safety - but at Lynemouth it's all intertwined with all the other generator control gear located on the floor beneath the turbines. I think my work there is done now. I wrote the weighing software for the twelve feeder systems that feed the fuel to the three boiler furnaces (four feeders for each boiler). 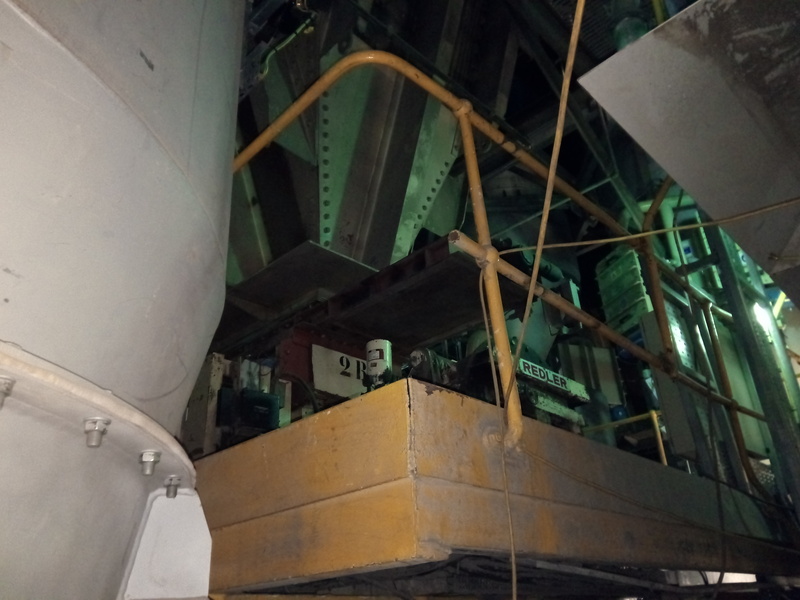 Each feeder system has a weighed hopper that holds about three tons of pellets and the pellets are transferred out by a variable speed screw at up to about twenty tons per hour. For a few minutes the hopper just empties so the weighing system knows the transfer rate. The hopper continues to feed the furnace via the screw even during the refill cycle (which takes about twenty seconds) so during the refill phase the tons per hour feed rate is calculated by monitoring the screw RPM - having built a picture of how RPMs convert to tons per hour during the weighed phases. 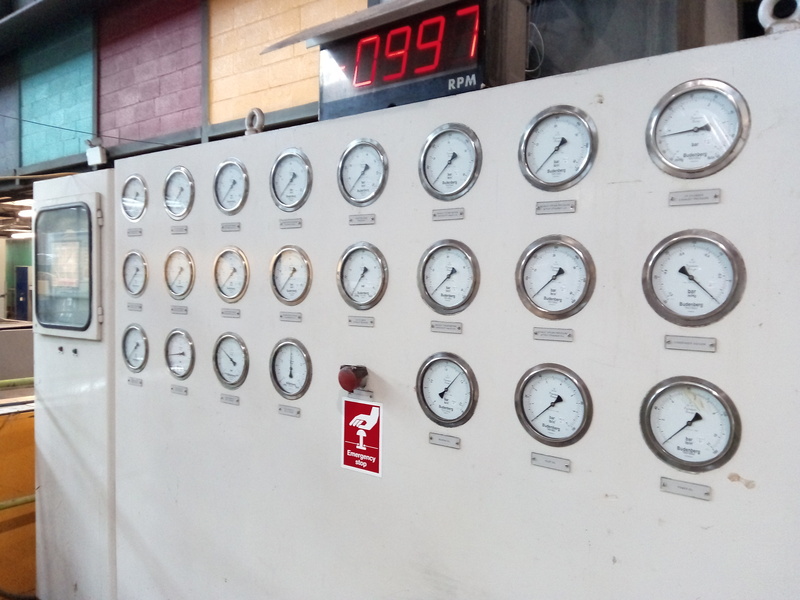 The screw speeds are controlled by a system that monitors the boiler pressure and adjusts the speed to keep the pressure at the optimum point. The pellets vary in density, energy density and water content, so the screw speeds are continuously adjusted to compensate. 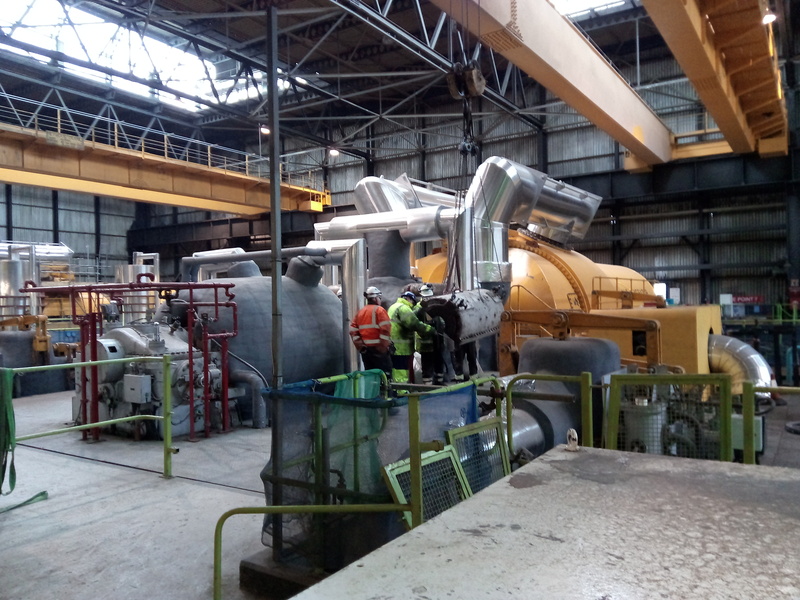 The plant was generating some electricity this week and should be ramped up to full production in the next month or so. It will be burning about 200 tons per hour of pellets then. 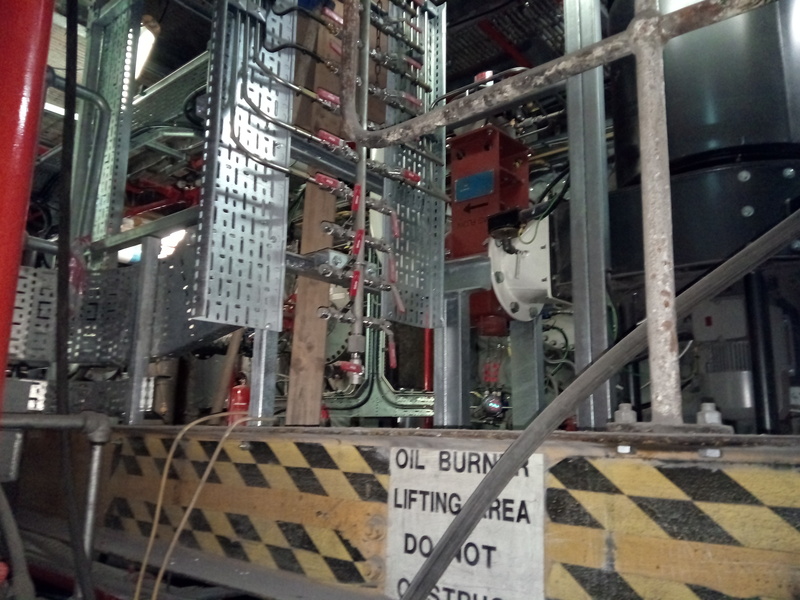 Apparently, burning this North American wood in England is classed as green and renewable so the plant will operate flat out 24 hours per day. 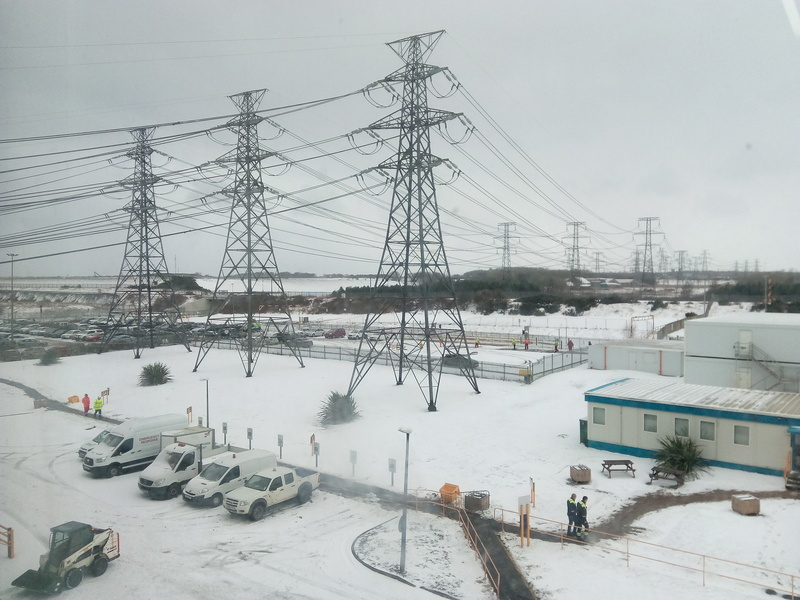 It will earn the owners some kind of clean energy grant amounting to about a million pounds per day - and that's in addition to whatever they make by selling the electricity they produce. Last edited by ceptimus; 03-29-2018 at 07:03 PM. The oxygen in our air is extremely corrosive once given a chance to do its thing, it's also the oxygen that makes hydrogen so dangerous. 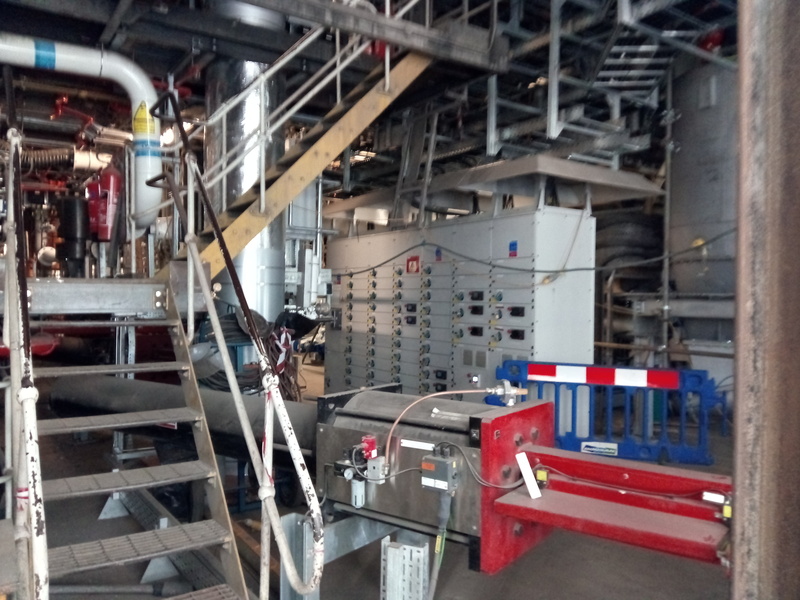 In a closed system hydrogen is a great heat exchange gas and has the added bonus of consuming any stray oxygen during production or high heat if oxygen corrosion is a worry. Really many highly flammable gasses make great heat exchangers, it's mostly human stupidity that has led to using alternatives. I assume a whole ton of bells and alarms would go off if the pressure ever suddenly dropped fast. Although there is something morbidly funny about the first warning sign being everyone talking in a higher pitched voice. I kinda feel like burning anything that comes from America is a gain on future green possibilities. I don't know much of anything about England's ecology but it could amusingly be a positive or at least neutral carbon footprint. The US has quite a number of sustainable green lumber projects with fast growing trees smart culling and reseeding. I kinda feel like burning anything that comes from America is a gain on future green possibilities. Yes ... send us your politicians maybe?